Tal y como estaba previsto hemos recibido la información completa del modchip UP (Undiluted Platinum) de PSP. El chip contiene una memoria NAND de 32MB, similar a la de PSP, la cual puede actualizarse gracias al conector USB incluido. En ella se podrán grabar tanto firmwares oficiales como desarrollos independientes, facilitándose completa documentación a la scene. Por defecto la consola arrancará con el firmware del UP, pero pulsando L1 durante el arranqué lo hará el de la PSP. El chip también servirá para arreglar consolas rotas por la actualización de algún fake. Su precio oficial es de 75 euros (impuestos no incluidos). The U.P. (Undiluted Platinum) is a flash replacement system for the PSP™ which allows the use of previous flash updates or custom firmware builds, opening up the possibility to run unsigned homebrew code on even the latest PSP systems. The U.P. contains 32MB NAND flash which is programmable from the PC via a high speed USB connection, using our user friendly software. You may boot the PSP from either its onboard flash or the flash contained on the U.P; the flash which is used is determined by a button press as the PSP is powered on (U.P. flash is used by default, hold L1 to use the PSP onboard flash). Since U.P. provides a secondary flash which the PSP can boot from, it can even be used to restore a PSP which has been "bricked". Every effort has been made to make our flash updater software, which will be freely available for download, both as easy to use and reliable as possible. The software also contains diagnostics which can be used by installers to determine if an installation has been successful or not. The U.P. has been designed to minimize installation difficulty and effort. A FPC (flexible printed circuit) cable is included which routes the essential signals from the PSP motherboard to the U.P. main board and U.P. USB connector. Copper enamel wire is included, which will provide the connection between the FPC cable and the motherboard signal traces. The FPC cable also helps by reducing the mechanical stress placed on the solder points, making a U.P. modified PSP shock resistant which is important for handheld systems. Installation aids are included, and installation diagrams for all PSP hardware revisions will be available for download, together with flasher software application, from our reseller's websites. More about installation together with install pictures closer to release. The FPC cable end to which the USB connector board attaches is routed into the battery compartment and sits above the battery. The battery cover can be replaced after flash updating and the cable remains safely in the compartment until the next update is required, whereupon the USB connector can be clipped in place within a few seconds. This means that the U.P. 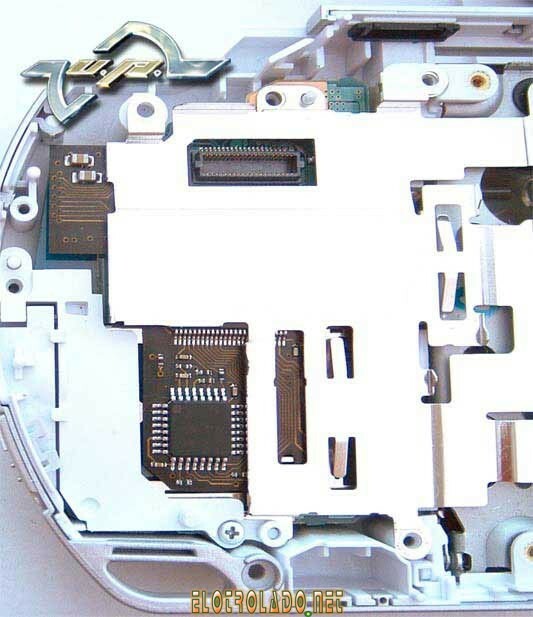 is completely contained within the PSP under normal usage and avoids any unsightly external modifications to your PSP. PSP is after all portable, let’s keep it that way! In order to maximise the benefits that U.P. can provide its users, we have decided to take an open source approach with U.P and will be releasing source code for any software we release as well as full documentation for the U.P. hardware interface - including information on how to control U.P. from within PSP programs. This will allow anybody to create software which can take advantage of what U.P. has to offer. We have also sent a few prototype units away to some of the scene's best software hackers in order to give them a headstart at working on custom flash replacements - cant wait to see what people will come up with!